Single-use plastic bags: useful, or an environmental nightmare? With Italy following a number of other nations which have banned their shops from providing free single use plastic bags, the issue is an important one. The question of exactly what benefits do flow from all the personal hassles of always remembering to take a re-usable bag when visiting the shops, needs a clear answer. The UK Environment Agency has now issued (22 February 2011) a report which answers a few of these questions on the lips of shoppers, and their report is available on their website for downloading. The report provides advice for retailers and shoppers on the carbon footprint of a range of different multiple use carrier bags commonly offered for sale at check-outs. In particular it asks the very pertinent question of how many re-uses of these “bags for life” are necessary before their environmental impact becomes less than for a single use bag which you throw in the bin as soon as you get home. Whatever kind of bag is utilized, the key to reducing the impact is to take it back and refill the same bag as many times as practicable whether for shopping, lining the kitchen bin or other purposes in the home, garden or office. The plastic ‘bag for life’ favoured by many ( low-density polyethylene ) only needs to be used 4 times to be certain that it has got a lower carbon emissions footprint than single-use, lightweight ( high-density polyethylene ) carrier bags. Lightweight single-use carrier bags have the lowest carbon footprint per bag when you consider them primarily for their resource use and production. Paper, heavyweight plastic and cotton bags all use more resources and energy in their production. Lightweight single-use carrier bags aren’t hugely negative, especially if you re-use them once or twice. It all comes back to how many times a bag is reused. The popular plastic ‘bags for life’ (low-density polyethylene), now routinely for sale at most supermarkets, do need to be used four or more times to ensure they have a lower carbon footprint than lightweight (free) bags used only once. Premium, heavier weight ‘bags for life’ that are made from materials which look like fabric and are made from woven plastic need more re-use. They need to be re-used 11 times before they will have a lower carbon impact than single use bags. Useful though this is, for the environmentally aware shopper, it clearly still leaves many unquantifiable issues in connection with the use of shopping bags unanswered. 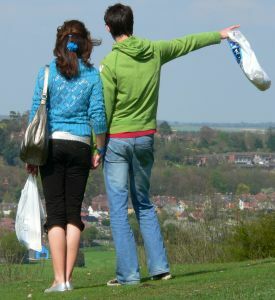 The Environment Agency itself acknowledges that other environmental impacts of single-use lightweight plastic bags such as litter weren’t assessed by the study. These are important, and also need to be taken into account. That is more difficult and much more subjective. There is in addition another wider problem with the use of plastics which oceanographers are becoming increasingly concerned about, and which needs scientific study. It is the one of the billions of bits of plastic floating in the seas of the globe, which continues to build-up. The worry is that fish are unavoidably ingesting huge quantities of tiny bits of plastic, and nobody knows what effects that will have on marine life over the coming years.